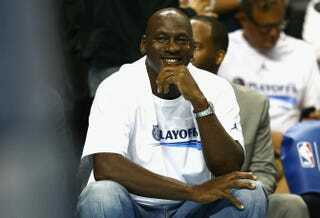 Charlotte Bobcats owner Michael Jordan watches Game 4 of the Eastern Conference Quarterfinals against the Miami Heat during the 2014 NBA Playoffs at Time Warner Cable Arena April 28, 2014, in Charlotte, N.C.
Detroit may be bankrupt and jobs may be scarce, but some diehard Air Jordan fans waited on line for about a week for a chance to spend $250 on a new pair of the commemorative sneakers on Saturday, CBS Detroit reports. Young men began camping outside sneaker emporium Burn Rubber in downtown Royal Oak, Mich., on Monday, the site reports. Their goal was to scoop up a pair of Air Jordan 6 Retros that honor Michael Jordan, the former Chicago Bulls player, entrepreneur and principal owner and chairman of the Charlotte Hornets. The shoes boast a special graphic on the back heel to commemorate the six biggest victories of Jordan’s storied career, according to Nike.com. “He’s legendary; these will be legendary,” Jason Thurmand, 28, of Detroit, told CBS.